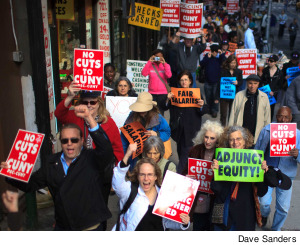 PSC members mobilized make a big difference on issues as diverse, but interrelated, as our contract, the CUNY budget and the health and safety of our workplace. Together, we've beat back efforts to impose pay lags, forced furloughs and inferior pensions on CUNY workers and restored millions in proposed cuts to community colleges. We've also won the protection of a union contract for CUNY's Research Foundation workers and successfully pressed CUNY to offer paid family leave. Now, at a time when public service unions are under fierce attack and politicians from both major parties are moving to shift the burden of budget shortfalls to working families and the poor, the need for action is as urgent as ever. Check the sub-menu to the left for our current campaigns and click here to see what we have won in past victories.